Construction upgrades to a 14-mile stretch of fencing along the U.S.-Mexico Border began Friday, Customs and Border Protection confirmed. The project area begins roughly one half-mile from the Pacific Ocean and extends eastward to the base of Otay Mountain. Other projects are underway in Calexico and New Mexico, where two-mile and 20-mile stretches of border, respectively, are being upgraded. In San Diego, construction crews will install 18- to 30-foot bollards topped with a steel anti-climbing plate. Bollards are sturdy poles too closely set for people to pass through. The poles will replace eight- to 10-foot tall scraps of corrugated Vietnam War-era metal installed at the border during the 1990s to prevent pedestrian and vehicles crossings. The scraps needed to be replaced with a “higher performing design,” according to CBP. Texas-based construction firm SLSCO was awarded a $147 million contract for the project. 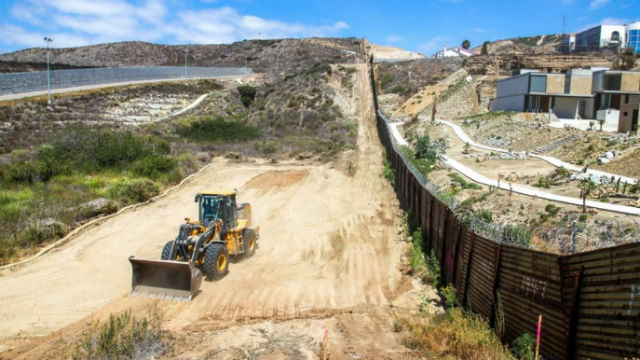 “The construction of this new substantial wall will improve overall border security, the safety and effectiveness of Border Patrol agents, the safety of the public and will enhance the atmosphere for business and commerce in the area,” San Diego Sector Chief Patrol Agent Rodney Scott said.